* Advanced Chess School is the next step on your road to chess mastery after Chess School for Beginners or Dinosaur Chess. * The program contains 2 large courses: Theory Essential Chess Knowledge and Playing Instructive Examples. * A total of 55 lessons with more than 1,200 instructive examples. * Several languages supported: English, Russian, Spanish. 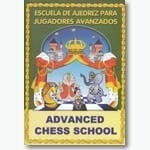 Advanced Chess School covers a wide range of subjects in the opening, middlegame and endgame. It starts off by teaching you how to checkmate the lone king and proceeds to more advanced topics, such as utilizing a material or positional advantage. The more advanced material, and in particular some of the exercises, will provide a healthy challenge even to intermediate players who can use Advanced Chess School to review and reinforce their knowledge. The exercises can also be used for speed training, even if you are familiar with the material. Overall, the main emphasis in Advanced Chess School is on tactics and basic endgame play, as is appropriate for players at this level. In fact, if you are looking for a tactics program, but are afraid that CT-ART might be too tricky, Advanced Chess School might be a good choice. Like other ChessOK programs, Advanced Chess School is based on training material prepared by an experienced coach. The author, Nikolay Zhuravlev, is a chess master from Latvia; besides being a highly respected trainer, he has authored many books for beginners and intermediate players. Study: The lessons in Advanced Chess School use both graphic illustrations on the board and verbal explanations. Several positions, often from real games, are used to show how the theoretical material works in practice. Practice: There are plenty of exercises allowing you to practice what you have learned. If youdon't succeed in finding the correct move you will be shown visual clues which draw attention to key aspects of the position. Play: To improve your chess knowledge, play selected instructive positions against the built-in chess playing program. Test: After studying and practicing you are ready for a test! Advanced Chess School keeps track of the score. After finishing the test you will get immediate feedback on your performance. Statistics: As you progress with Advanced Chess School and complete more tests, the program evaluates your rating changes based on your performance. This feature is helpful to trainers, who can use it to compare the performance of their students. IBM-compatible PC, 16 Mb RAM, Hard Disk 100 Mb of free disk space, Windows 2000/NT/ME/XP/Vista/7. No additional software is required.